Tributes have been paid to a Doncaster journalist who became known as the 'effing and blinding' vicar after being ordained. 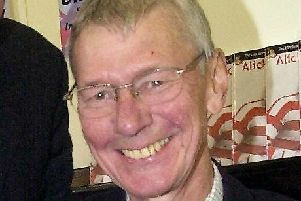 Tony Fry, who hailed from Sheffield, worked at the Doncaster Advertiser and was also second in command at the Sheffield Telegraph for a number of years. He also worked in national newspapers during his career and spent time as a news reader on BBC World at One, according to newspaper industry website Hold The Front Page. He later went on to teach as a lecturer in journalism at Stradbroke College, in Sheffield, as well as being ordained in the Church of England and serving as a parish priest. Darren Burke, digital journalist at the Doncaster Free Press and Sheffield daily The Star, was taught by Tony at Stradbroke in 1993-94. Darren said: “He was a quirky and colourful lecturer, very much from the old school style of journalism, always immaculately dressed and keen to pass on his years of experience to us raw recruits. Huddersfield Daily Examiner reporter Robert Sutcliffe worked alongside Tony at the Advertiser in the early 1990s. He said: “He was known as Tony Fury on account of his short temper and also the ‘f…ing and blinding vicar’ by the managing director of Local Network Publications Mike Cummings, as he trained for the C of E and I believe was ordained. He used to bless students at Stradbroke. “He was from ‘money’ and I think his father was an Admiral. He was very entertaining company. It is believed Tony was in either his late 70s or early 80s when he died.